Virtual base class encapsulating fourth-order CoordSys. The FourthOrderCoordSys class extends the CoordSys base class by providing API elements and implementation details specific to fourth-order discretizaitions. Implementations of specific coordinate systems will be provided by derived classes. Jacobian evaluated at location X in real space. Jacobian evaluated at index locations of a_J. Jacobian evaluated at locations Xi in mapped space. note that a_X is in real (not mapped) space. 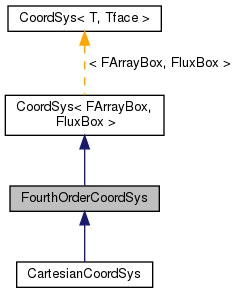 Implements CoordSys< FArrayBox, FluxBox >.